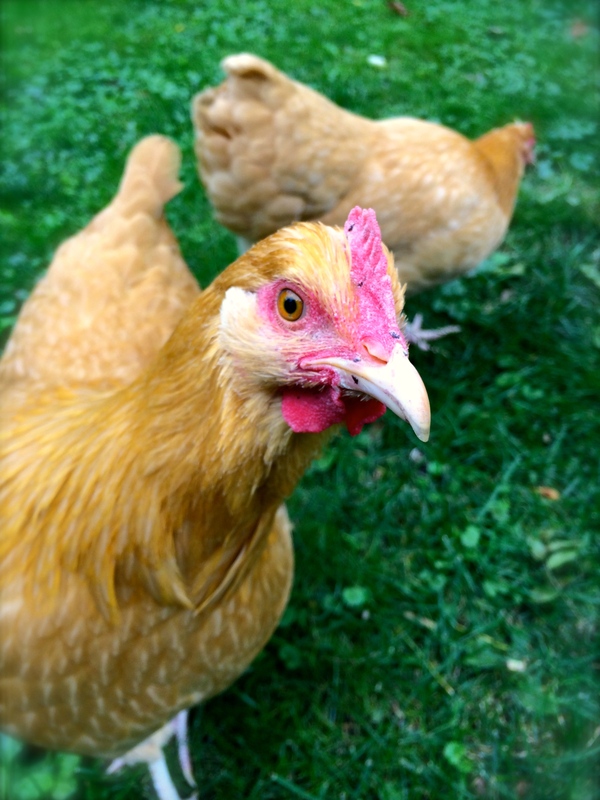 Chickens are about so much more than just laying eggs. Although that’s a very tasty benefit to keeping them, they also patrol the yard for ticks, slugs, and any other insect unlucky enough to get in their way. They provide fertilizer for the grass, flowers, and the vegetable garden. And they are a very handy, non-motorized garbage disposal, taking care of most kitchen and food scraps not headed for the compost bin. Plus, watching their antics can pass as an afternoon’s entertainment very easily (especially with a tasty beverage handy). They will continue to earn their keep long after their egg-laying days are over. 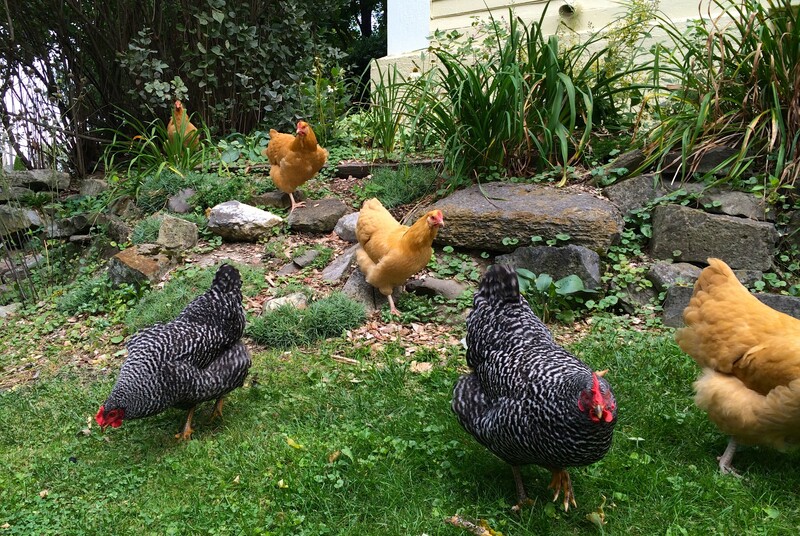 Six chickens currently call the farm home: four Buff Orpingtons and two Plymouth Barred Rocks. Both are known to be cold-hardy species for the Northeast, and do well as both egg-layers and as ‘meat birds’ (which is unlikely to ever be their fate here). While I’m not opposed to eating chicken, I can’t imagine eating one of the little fluff-balls I raised. And then proceeded to name. End of story. Pretty fresh out of the egg themselves, chicks need to be kept warm for several weeks. A cardboard box supplied with food, water and a heat lamp serves them well. They grow up fast and soon learn to use their wings. 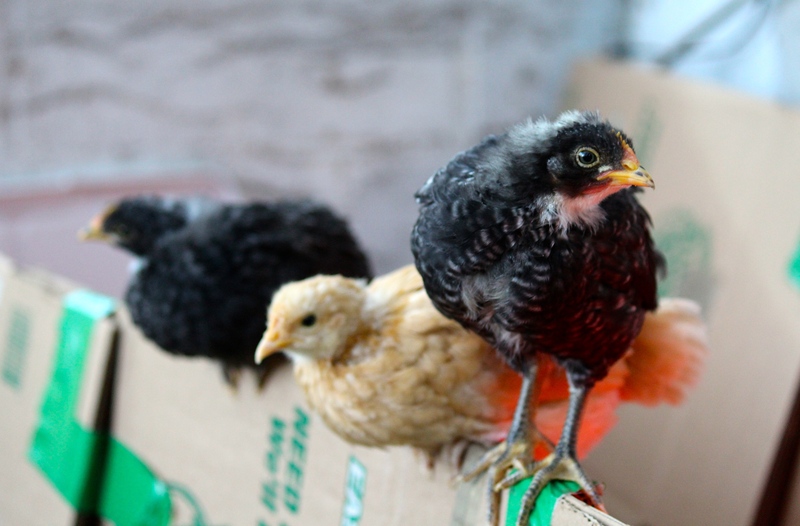 Here they are hanging out on top of their box, practicing their roosting skills. 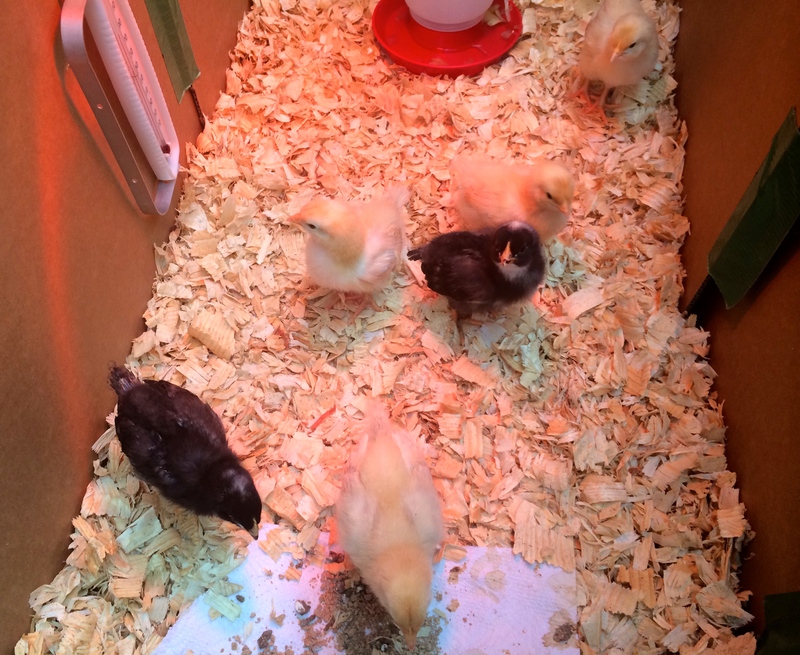 When they no longer needed the constant temperature of a heating lamp, the chicks moved outside to their new coop. 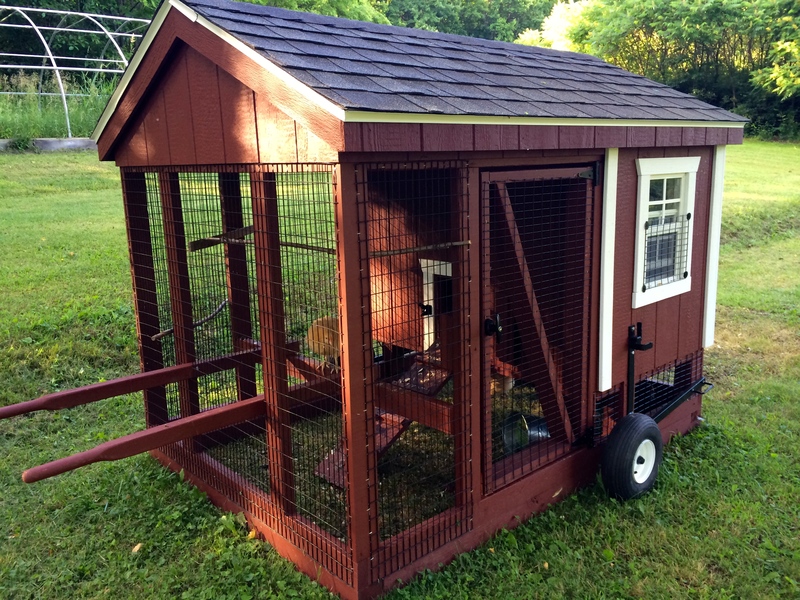 They can eliminate the grass below in just a few days, which is perfect for starting a garden bed, or the coop can be moved to avoid that issue. A screened bottom flush with the ground helps keep out any interested predators. 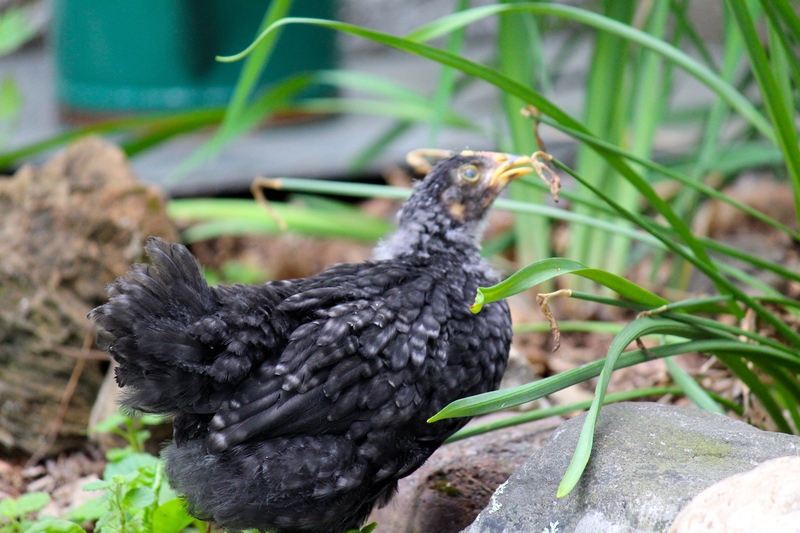 Chicks will try to eat just about any plant they come across, so you have to be prepared for them to do some damage to ornamentals when allowed to free-range. Mine, for example, found out they love hostas. Fortunately, they have short attention spans! The chicks arrived in May and most began laying eggs by the end of summer. 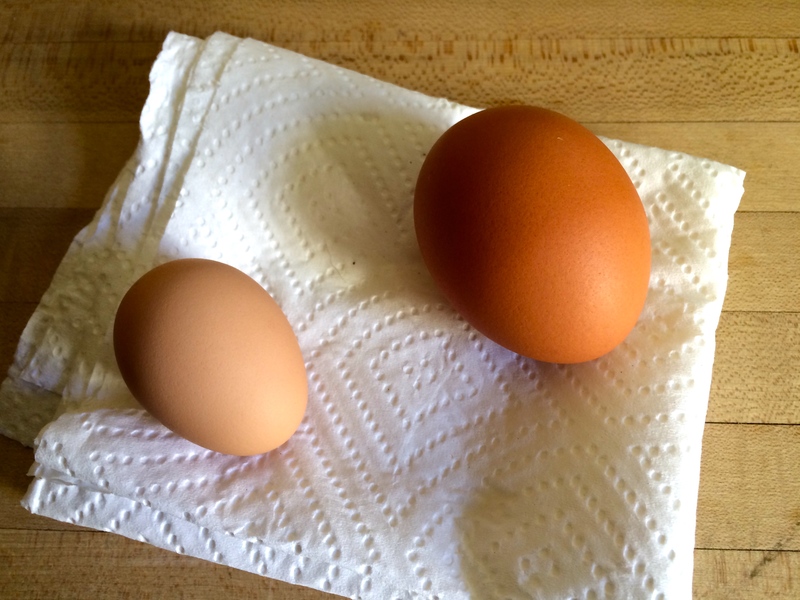 The eggs start out so cute and small, like the one on the left, and gradually increase in size as the chickens mature. The chickens will continue to lay eggs for two to five years, but can live for around fifteen. Chickens are surprisingly curious, and pretty smartly so. They figure out quickly who means trouble and when danger is near. Ginger here is one of the braver and more friendly ones. She even likes being picked up!